Just saw this at Target, looks like it just got put out. I can't find anything about it on the internet, including at Coleco's lame "coming soon" site, so I suspect it's brand new. They had some other Coleco-branded licensed stuff, notably a pink Disney handheld in addition to the usual Sudoku and Casino stuff. There was also a 10-in-1 driving game, virtual boxing, and virtual ping pong. The Sega set had a disclaimer "Sega is not affiliated with the Coleco console." The unit is black, about the size of the VGPocket handhelds out there (about 2"x4"), and has TV-out leads included. It contains 20 8-bit (Sega Master System and Game Gear) games, including including Sonic Triple Trouble, Fantasy Zone, Super Columns, Alex Kidd, Fantasy Zone, Ecco the Dolphin, and others. Looks pretty good, but it was $49.99, and these games are easily to find elsewhere in other forms. I'll be watching for a price cut just in case, though. Hardware: The build quality of this device is well above average, definitely better than the VGPocket games, and at least on par with the GP2X. The case is glossy black plastic with a subtle marble/sparkle finish. The whole thing looks nice in person, despite the nasty red COLECO logo. It feels substantial in the hand, but definitely smooth and pocketable. It's larger than the GB Micro, about the size and thickness of a largish cell phone, but very light. It doesn't make any noise when you twist it. There are two speakers on the front of the device, probably dual mono output. The screen is large and bright, with excellent color saturation and contrast. The buttons have a nice springy feel to them. The two buttons above the D-pad on the left are volume + and -, which come in handy since the device doesn't remember your volume setting when you switch it off. The buttons over the A and B action buttons on the right are RESET (to the game select menu) and START. There are no shoulder buttons or volume wheels on the device, just a small slot for a wrist strap. A headphone jack on the bottom of the unit is intelligently placed and doesn't get in the way. Hackability? : The unit takes 3 AAA batteries and you need a small screwdriver to open the battery compartment. The device is held together by 4 small screws so it looks like it would be easy for Ben Heckendorn and friends to get inside easily. I didn't open mine -- I want to play some games for my fifty bucks, first. There's a jack for an external power adapter (DC 5V), as well as a standard mini-AV jack for audio/video output (included) should you want to play on the big screen. I'm happy with the built-in games for now, but it would be neat to expand this device. It almost feels like there's enough room in the case to do something like that. Software: I don't know if this is a "SMS-on-a-chip," but it feels like the real thing to me, rather than emulation. Sounds are loud and accurate, and video is displayed in the game's original aspect ratio. Since different video systems are present on the software in this device, some games are upscaled to fill the whole screen, while others are displayed in a window. Text is readable in all modes and motion blur is minimal -- on par with GBA Micro and MUCH better than the original Game Gear. It's nice to have Sonic Triple Trouble on the run in my pocket, and having Snail Maze without a TV-based console. The game selection was done by someone who knows the Sega library, as there are no issues like those you sometimes see with pirate multicarts, such as duplicates, unplayable dogs, or titles that need the lightgun or 3D glasses. These are OLD games, but unlike some of the recent "new" games that were created for plug and play devices, most of these have a measure of professional polish. In other words, I'd rather play great games from the late 80s than crappy games from last week. 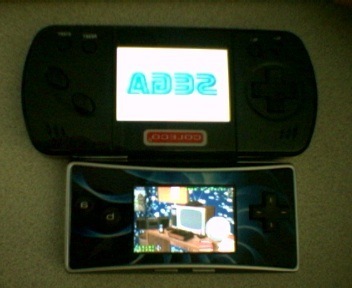 Here's a picture of the Coleco handheld next to my GBA Micro for size comparison. Sorry about the inverted picture -- rest assured that the text is the right way round on the real thing. This is the same thing as the "PlayPal Portable" going to $60 on Ebay right now. And to think I thought Coleco was doing something unique ... well they got it on Target's shelves, I guess that's something. I think I'll wait a little while for the price on this one to drop. Obviously, the form factor is quite different, but it looks like the company that had the rights to make these finally managed to get someone (Coleco? Or at least some company with the right to put the Coleco name on it, too) to do distribution; one of the links on the second page leads to a page with a quote from the company that "we're allowing distributors to have their own console systems designed which takes about 45 days for the mould toolings to be done." I'm rather disappointed to see that none of the Phantasy Star games made it onto this unit. Then again, maybe this is wholly separate from the ones announced above. Flojomojo, does the packaging have any other company name on it besides Coleco's? Since "Coleco" is just a name now being badged onto other companies' products, there must be some other name on the box, the company (or companies) that did the actual design, manufacturing, and/or distribution. If this Coleco model really is related to the news items above, then Asian Toy Source should be the design company, and it sounds like they may have done manufacturing as well. I'm a bit confused about Sega's plug-and-play licensing activities, though. Radica was their first licensee, and it appears they only had rights to Genesis/Mega Drive games. More recently, Techno Source released an 8-bit Sonic Blast unit and at least announced a Sonic Chaos/Spinball unit. But, now, yet another company has gotten rights for 8-bit games. Are they just selling non-exclusive rights to anyone who wants some? I was similarly confused back when Capcom sold plug-and-play rights to both Jakks Pacific (Capcom TV Game) and Radica (Street Fighter II' Genesis Play TV Legends). If one company's license had expired and been picked up by another, I would have understood, but that was simultaneous. Similarly, Techno Source only released their Sonic Blast unit a few months ago, yet here come more 8-bit Sega games from someone else. Oh, well. I guess they make more money this way. Only two halfway good games in the package. I think I'll ignore it. More recently, Techno Source released an 8-bit Sonic Blast unit and at least announced a Sonic Chaos/Spinball unit. But, now, yet another company has gotten rights for 8-bit games. Are they just selling non-exclusive rights to anyone who wants some? I was similarly confused back when Capcom sold plug-and-play rights to both Jakks Pacific (Capcom TV Game) and Radica (Street Fighter II' Genesis Play TV Legends). If one company's license had expired and been picked up by another, I would have understood, but that was simultaneous. Similarly, Techno Source only released their Sonic Blast unit a few months ago, yet here come more 8-bit Sega games from someone else. Techno Source released the earlier Coleco plug-and-plays (the Coleco brand is licensed by them from River West Brands), so I imagine they're behind this as well. Any links to some better pictures? It seems like a nifty toy to me. It looks like the "new" Coleco is doing right by their brand legacy. Please expand on this comment, because I don't see anything having to do with the legacy Coleco brand about this thing. What am I missing? Edited by else, Thu Oct 12, 2006 9:42 AM. From what I understand, River West isn't the company picking and choosing the products that receive the "Coleco" name, it's Techno Source... though River West does share some culpability for licensing the name in a way that allows it to be used on any random product. That said, at least the Sega 8-bit hardware is very similar to the ColecoVision, so this association is less far-fetched than the previous Coleco plug-and-plays. As a completely random aside, I have a hobby of buying/drinking random sodas as I find them. A friend found some cans of "Soho" sodas at a Big Lots bottled by the Arizona tea people, and I was choking down some nasty flavor of it when I read the label... Soho is another old marque revived by River West Brands, licensed to another random company. Weird. Other brand revival companies tend to stick to one business (Prestige Products sticks to pharmacy/health/beauty, f'r example), but soda and video games? What a weird grab-bag of trademarks. Those are not "halfway good" games, they're totally great games. So is Sonic Triple Trouble. The halfway good games are Global Defense, Astro Warrior, Quartet (Duet), Columns and Alex Kidd In Hightech World. And hey, don't forget it's got freaking Snail Maze on it, too. That's worth the cost of admission right there. Using the SMS joystick for the 20in1 was my decision for the other unit. I don't know how Coleco got involved for Asian Toy Source, I have a call tomorrow with HK, so I will have to find out what transpired. Dude! Is that Sonic deal gonna be released in the states? Maybe they just grabbed the ol' majesco game gear design and hardwired a multicart into it? OK, that fist-shaped joystick disturbs me. Edited by Feralstorm, Thu Oct 12, 2006 8:57 PM. Where would Target stock something like this? I didn't see it with the Jakks games, the handheld LCD games, or the "real" video games. Maybe mine just doesn't have them yet. Why right next to the new Mattel Hyperscan, of course! Saw it today at Target, looked kind of cool, about the size of the SMS controller, a bit bigger though. Screen looks really small though. Not much bigger than a Dreamcast VMU screen! However, it can plug in to a TV or monitor, making it a pretty cool thing to pack for the kids on long trips, as you can use it with a portable DVD player. Need to get Philips to release something under the Magnavox brand, too. Is this another crappy NES-on-a-Chip from HK or does it have actual GG hardware in it? A NES could never reproduce Master System games. I'd think it's a Genesis-on-a-chip with built in SMS converter. I finally found where these are sold at Target. At the one I went to today, at least, they were being sold in the Electronics department, near, but not actually adjacent to, the video games (I first looked for them by seeing if I could first find the Hyperscan, but it was nowhere to be found in the store). The shelf area was actually chock full of Coleco-branded products. And for the record, they are solely Coleco-branded; there is no "Techno Source" or "Asian Toy Source" or even "River West Brands" on the package, only "Coleco Holdings." Besides the $50 Sega handheld, they were also selling touch-screen, black-and-white sudoku, crossword, and casino handhelds for $20 each, as well as 10-in-1 color LCD handhelds that could plug into a TV, in a sports and a racing variety (both generic, not Sega), each for $30 (a third $30 product was listed, described as a "target" game, though there were no actual products there). It seems this new Coleco thinks people should pay a sizable premium for its name. Also, there were 4 other Coleco-branded products there: a virtual ping-pong plug-and-play, a virtual boxing plug-and-play, a girls DVD game, and a Buzztime- (and Coleco-)branded trivia game system. Next to this Coleco section were empty hooks for PDP's upcoming GameIt handhelds with Disney themes (but again, those will be from the VG Pocket people, not Coleco). Still been unable to find this at my local Target, even with the HypserScans, Migos and other assorted things with screens. Does everyone else have them at their Target? I'm more than a little interested. Edited by else, Fri Oct 20, 2006 5:57 AM.